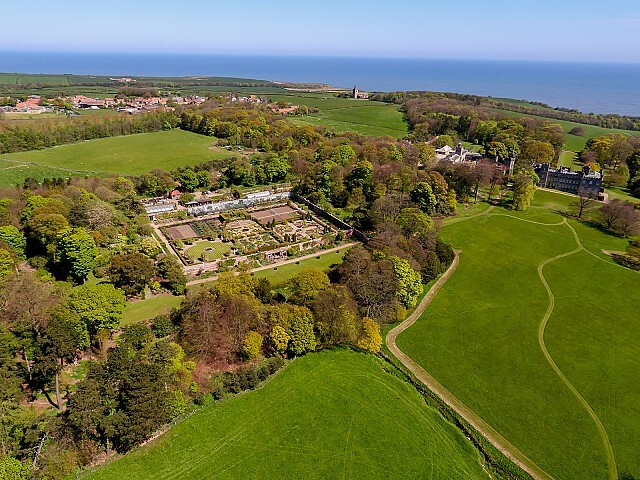 The earliest maps of Mulgrave show a formal garden, divided into three narrow longitudinal sections, on the piece of land at what is now the front of the house. 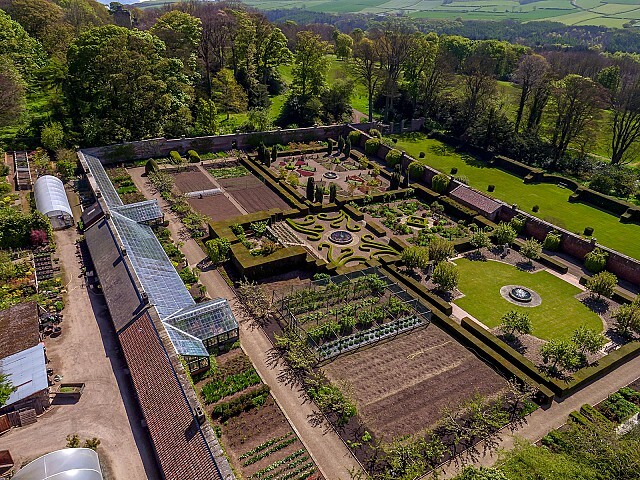 The walled kitchen garden was then situated on that side, close by, where the tennis court is today. 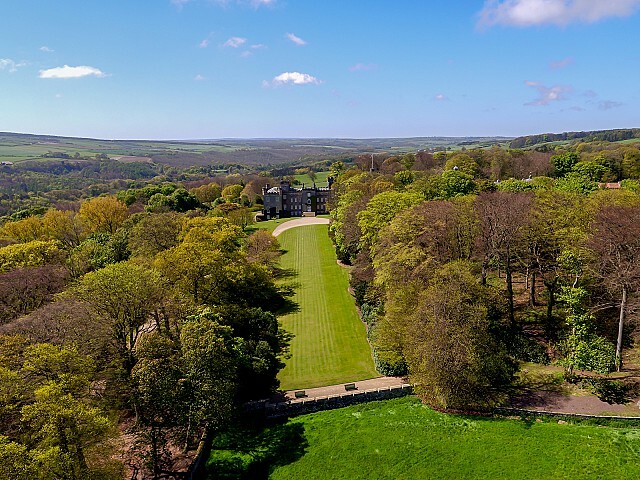 During the last years of the 18th Century various attempts were made to ‘improve’ the grounds, in line with the fashion for naturalistic landscape. Thomas White was the first of these ‘improvers’. We don’t know exactly what he did but it seems probable that he moved the kitchen garden to its present position away from the house, and sunk a semi-circular ha-ha to the south and west sides, traces of which can still be found between the house and the present-day reservoir. The chimneys in the kitchen garden were part of an early and short-lived experiment with the aim of protecting wall-trained fruits from frost. On cold spring nights when the apples, plums and pears were in flower, hot coals would be placed in little chambers cut at intervals into the base of the garden wall. These chambers gave onto a maze of passages inside the partially hollow walls. The idea was for the hot air to be drawn through them, generating enough heat to keep the frost from damaging the tender blossoms, before exiting by the chimneys. It wasn’t a very effective system and was soon succeeded by glasshouse technology. In 1792, this same Lord Mulgrave, Constantine John, invited the landscape designer, Humphry Repton, to submit a plan for Mulgrave. Unfortunately, Mulgrave died before the commission could be put into effect. Some of Repton’s proposals were nevertheless carried out by his heirs, including the restoration of the Old 13th Century Mulgrave Castle (in Mulgrave Woods) as an ornamental folly, the creation of a tunnel as part of a new approach through the woods, and tree plantings to screen the walled garden and frame the profile of the house. In the 19th Century and into the early 20th Century, some ‘gardenesque’ and Victorian features appeared: there were formal flower beds on the lawn between the house and garden, and also on the flat strip of garden where the long border now is. At this time the glasshouses in the kitchen garden extended all along the top wall of the garden and down the east (west-facing) side. Before the second world war, my father-in law, Oswald, 4th Marquis of Normanby, engaged the designer Norah Lindsay to remove the formal beds. He then replaced the rose beds in the long garden with a border of summer perennials and shrubs. Lindsay may also have been responsible for a ‘water garden’ below the long border. In 1951 Oswald married the Hon. Grania Guinness and they continued to develop the garden into the shape it now is. They engaged the architect Geoffrey Jellicoe to alter the walled, or kitchen garden, which up until then had been devoted to growing food. It was his idea to build up the central terraced area above the strawberry beds. Later they added the yew hedges and fountains - further measures that draw the eye to the horizontal and distract from the fact that the garden is on a slope. My parents-in-law were deeply involved with the garden and were responsible for many of its features. They planted the drifts of daffodils round the house. They created the ‘rooms’ at the bottom end of the walled garden. Both the formal spring garden to the east, with flowering amelanchiers, imperial fritillaries and Irish yews, and the autumn garden, with its elegantly simple structure of lawn, Italian statues and heavily-fruiting crab-apples (malus ‘red sentinel’ and ‘golden hornet’) are still very much as my mother-in-law designed them. The box scrolls below the strawberry beds were taken from a pattern Oswald drew on the back of an envelope. In the early nineteen-sixties, with the help of Major Daniels, he also made a shrub garden to the west of the walled garden. It is sometimes said that Lanning Roper had a hand in the design of the Mulgrave gardens. He did not; though he was a great friend of my parents-in-law and when he came to stay at Mulgrave he would often work in the garden for pleasure. I married their son, Constantine, in 1990, a couple of years after his parents had decided to move out of Mulgrave. I loved the garden so much that I didn’t want to change it, but over the years we’ve made a few developments. A garden must change, or it becomes a museum. Some of these were the consequences of necessity. For instance, the garden used to be open at its eastern approach; but one day the deer population of Mulgrave Woods, having never troubled the garden in its two hundred years of existence, made a collective discovery that the long border was a larder full of delicious young flower-buds. After many frustrating summers, we built a wall and a gate to foil their plans. Some were attempts at economy: my parents-in-law had returned the land at the back of the house to a carpet of mown turf, sweeping up to the house as it would have in the 18th Century. We decided to save on the endless mowing and let the grass grow long, along with what wildflowers it naturally supports. We also returned the old park – which had been fenced into fields during the war – to parkland, and planted it with clumps of oak and chestnut. When Grania, my mother-in-law, restored the Old Castle for a second time to the romantic edifice we now see (completed in 2000), we cut down trees to make views through to it. Over the last 25 years, we have gradually fringed the horizon to the north and south with extensive tree plantings. With Jim Mortlock, Mulgrave’s head forester, and his team, we’ve planted more than 40,000 trees there: mainly ash, cherry, birch, pine, larch, oak, beech, thorn and Spanish chestnut. Closer to home, we made some alterations to the walled garden. In 1993 the designer Arabella Lennox-Boyd created a new rose garden, and turned Jellicoe’s terrace, which catches the sun in the darkest parts of the year, into a place for the earliest things – little bulbs, and scented winter shrubs. She also helped us re-model and extend the shrub garden to accommodate our growing collection of flowering shrubs and trees. Then, Penelope Hobhouse re-planted the long border – which was geared for June – as a late summer border, so that it would be at its best in the school holidays. We extended the greenhouse to grow more indoor fruit and to shelter potted camellias in winter. More recently, we’ve turned our attention to the area between the house and the garden, planting ornamental trees and shrubs and spring bulbs. Snakeshead fritillaries are now proliferating here of their own accord. Neither of us is a hands-on gardener. Everything in the garden, inside and out, is the result of the dedication, tireless work and phenomenal skill of our head gardener, Jonathan Parkinson, and his brilliant team. If you see any of them during a visit to the gardens, I hope you will say hello.